Hello friends today here I come up with one of the important post In Blogger about creating a sitemap. This is we can say the second most important step which one should perform after creating a blog or after making a website. I hope you guys are aware about the team sitemap. But there may be few newbie in this blogging world who might be not aware of sitemap. So, basically when somebody create a free blog with either blogger or WordPress or when somebody create a website. The first thing in there mind is "how they will get indexed in Google or Bing search engine" ? So, for that sitemaps are used. Its basically a simple few lines of code which need to be submitted to Google webmaster tools (Read about Google Webmaster Tools) for getting the blog's URL in Google search results. So, till now i guess everyone understood the term sitemap and it uses. Now, lets quickly see how you can generate the sitemap. See basically we create blogger sitemap for blog or we create sitemap for website and there are many tools available on internet from where you can create sitemap online or you can generate sitemap online. I'll share it here with you. But I want you to keep reading this and understand the meaning of the sitemap code. So, you can create/edit your sitemap accordingly. Here I'm taking the example of SolveMyHow.com ! The code above shown is the sitemap of SolveMyHow. 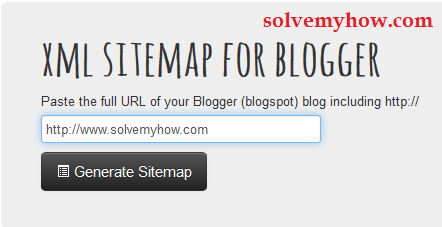 Now, if you wanted to create your sitemap then just replace "www.solvemyhow.com" with your blog's or website's URL. Keep the rest things as it is. This code is for Google Adsense robots to serve you the best contextual ads. If you are using the Google Adsense network then keep it as it is, else exclude it. This is for all Google bots marked with asterisk (*). Here this tag means that web crawlers can crawl our blog's homepage. Disallow is particular used for disallowing the Google bots to crawl particular web page or particular post.
" Disallow : /yyyy/mm/Post-URL.html "
Here "yyyy" stands for year like "2014" and "mm" stand for month "12" . Similarly, You can also Disallow the particular page for indexing.
" Disallow : /p/Page-URL.html "
Sitemap refers about indexing the post in the search results. Discussed before in this post. If you're facing problem in generating the sitemaps manually. Then you can generate sitemap online too from ctrlq and xmlsitemapgenerator ! I'm putting my all efforts and trying hard to make these post as easier as possible. Hope you like them and if you've any doubt regarding this post. Please, do let me know via comments and don't forget to Subscribe for our free newsletter to get answer of every HOW into your INBOX !